Welcome to the Chinese Embassy. It is a pleasure to have you with us to launch the China Season of the 2015 China-UK Year of Cultural Exchange. During Premier Li Keqiang's visit to the UK in June last year, the governments of China and the UK issued a joint statement, in which 2015 was designated as the Year of Cultural Exchange between the two countries. The UK Season lasted from January to June. The China Season began in July. In March this year, The Duke of Cambridge visited China. By painting the eye of a Shaun the Sheep model, he launched the UK Season. The series of cultural activities that followed were a successful display of the best of British creative industry. They were hugely popular with the Chinese public. Right now, it is the China Season. A rich variety of cultural events are arriving in the UK and lighting up the stages here. Among them are the National Theatre of China, the PLA Military Band, Pianists Lang Lang and Wang Yujia. The British audience is guaranteed to be wowed by top-notch artistic delight. It is of special significance that we are here today to launch the China Season of the China-UK Year of Cultural Exchange. I want to summarize the significance of the China Season with three 'highlights'. First, the China Season highlights the proud history and culture of China and the UK. Culturally, China and the UK are both influential countries who have contributed enormously to human civilization. Both countries have created a splendid history and culture. Both are proud of their cultural tradition, yet both are keen on innovation and creation. China boasts a five-thousand-year uninterrupted civilization. It is the birthplace of the profound oriental wisdom that is forever a treasure in the palace of world civilizations. Britain is where the Age of Enlightenment and the Industrial Revolution began. Its scientific and technological achievements, its economic, financial and legal systems, and its industrial and commercial culture have had a huge impact on the world development since modern times. At the opening of the UK Season earlier in the year, the Duke of Cambridge said,"China and Britain are united in our experience as countries with a proud and ancient history". I cannot agree with him more. And I firmly believe that China and the UK are capable of making even greater contribution to human civilization in the future. 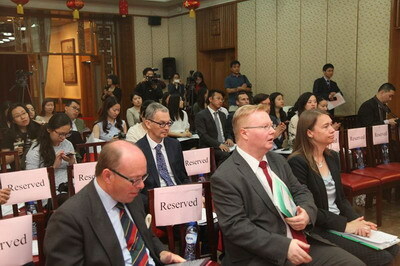 Second, the China Season highlights the cultural exchange between China and the UK. Culture knows no border. Exchange sees no finish line. The geological distance is no barrier to cultural exchange between China and the UK. Throughout many years of mutual exchange, the people of China and the people of the UK have all along admired and appreciated the culture and civilization of each other. When Confucianism and China's imperial examination system were first introduced to Europe, they were held in esteem by British enlightenment thinkers. Likewise, the British Renaissance philosophers, writers and artists became household names in China. Shakespeare's works were published in China as early as a hundred years ago. Many of his plays have appeared on Chinese stage and sometimes in the form of Peking Opera. In China, people simply love Shakespeare. In Britain, the works of Chinese playwrights Cao Yu and Ba Jin take the fancy of local audience. Two weeks ago, the National Theatre of China brought the Chinese version of Richard III to London. This was the first important performance of the China Season. This Chinese interpretation of Shakespeare's classic was warmly applauded by the British audience. It is therefore my firm belief that the colourful events of the China-UK Year of Cultural Exchange will help build a broad platform for cooperation between the cultural and creative industries of our two countries. These events will open up windows for the Chinese and British people to share the best of their literature and art, and to enjoy the fruits of mutual learning. Third, the China Season highlights the strength of cultural exchange in promoting sustained and in-depth development of China-UK relations. People-to-people exchange is the foundation for state-to-state relations. As an old Chinese motto goes, "Affinity between the people holds the key to relations between countries." In 2011, the governments of China and the UK reached an important consensus. We decided to make people-to-people exchange one of the three strategic pillars of our bilateral relations. The other two are China-UK Strategic Dialogue and China-UK Economic and Financial Dialogue. People-to-people exchange will foster amiable sentiments and mutual understanding between the people of China and the UK. This will in turn provide rich soil for friendly ties between our two countries to grow even stronger. It will enable us to make China-UK comprehensive strategic partnership more solid and more energetic. Thanks to the concerted efforts of both sides, China-UK people-to-people exchange has been more active in recent years than ever before. l In China, over 300 million people are learning English and hundreds of millions of football fans identify with Premier League clubs. l In the UK, there are 27 Confucius Institute and 113 Confucius Classrooms, more than any other European countries. n Over 500 secondary and primary schools have Chinese language courses. n 51 pairs of provinces, counties and cities have entered into sister relationship. n And the number of Chinese tourists coming to the UK is increasing by double digits. China and the UK must strengthen people-to-people exchange. We must expand cultural cooperation. And we must promote mutual learning. This is a definite consensus of both the governments and the people of our two countries. And this consensus will reinforce the popular support for deeper and sustained development of China-UK relations. 2015 is a big year for China-UK relations. Prime Minister Cameron called it a "golden year". In October, at the invitation of Her Majesty The Queen, President Xi Jinping will pay a state visit to the UK. This visit is expected to mark a new milestone and a 'Golden Time' in China-UK relationship. Right now, both China and the UK are working hard to get ready for this important visit. Next month, the Third Meeting of the China-UK High-level People-to-People Exchange will be held in London. Against this backdrop, today's launch of the China Season in the UK cannot be more timely. I am confident that the events of the China Season will bring our cultural exchange and cooperation to a new and higher level. They will in turn give new impetus to the development of China-UK relationship. 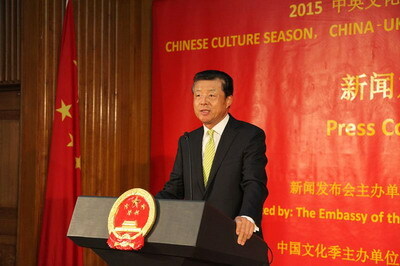 In conclusion, I wish the China Season of the China-UK Year of Cultural Exchange complete success.